It’s no secret that I’m a born and raised girl from Surrey and as such, I love to use my site to share some of lighter side of the City — from park info and news, to development and festivals like Winterfest, there’s so much happening that unfortunately doesn’t always end up in the limelight. At the end of March I’ll have my first speaking engagement in my hometown, sharing some blogging basics at the Surrey Museum. 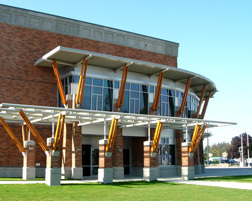 The Surrey Museum hosts many other programs, aside from the adult speaker series, and has some upcoming spring break sessions including their Tot Tour workshops for pre-schoolers, as well as the Thinking Caps Club for 7-10 year olds. As a side note, there was also a call out today in the Now newspaper for memorabilia to add to the Surrey Museum. I encourage everyone to stop by this great facility (not just for my session) and if you have any questions you’d like to ask me ahead of time about blogging, please feel free to leave them in the comments and I’ll try to address them on the 26th. Update: This was featured in the Surrey Leader March 20th, 2009. Cool! I will call you tomorrow for info on the PSA!